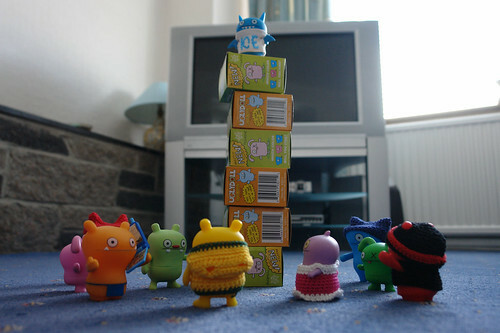 Uglyworld #105 - Jeero Shows The Other Guys The Box Tower, originally uploaded by www.bazpics.com. Jeero shouted on the rest of the guys to leave unpacking their cases and come look at what was sitting in the living room in Glasgow. Everyone was amazed at the tower of boxes, well everyone except Wage who was still standing on his mobile phone (we're beginning to wish we had never given him it now).